The next few days several tests were performed on Adelyn and it was discovered she had several other defects - some major and some minor. The original two heart defects were still there but two more complex defects were detected. Along with the heart defect our sweet baby girl had a number of other challenges. We kept very positive because so far everything we were facing was "fixable". 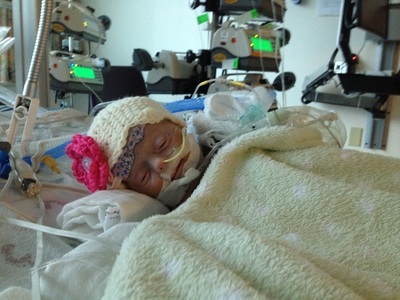 Adelyn was able to breathe on her own and went into heart surgery on October 27, as healthy and ready as she could be. It was discovered during heart surgery that she had a narrowed trachea which was another major defect. Adelyn made it through heart surgery pretty well but we knew we had a long road of recovery ahead of us. 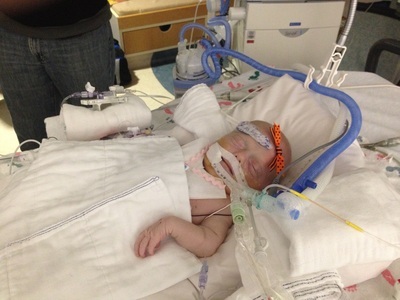 Due to swelling Adelyn's chest cavity had to remain open for a week until the swelling went down enough to sew it up. This meant we literally could see our daughter's heart beating. 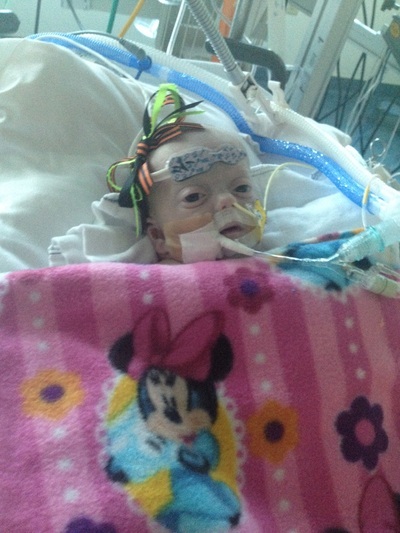 After getting her chest cavity closed the next goal was to get Adelyn's ventilator removed. Adelyn had a great week and each day she got stronger and stronger. She still had some issues but we were moving in the right direction. On November 7, they took Adelyn into the operating room to attempt to remove the ventilator and it was successful, for about 12 hours. On November 8, she had to be placed back on the ventilator as she was just struggling too much on her own. We could not see it immediately but Adelyn's health was starting to decline at this point. Adelyn's white blood cell count was elevated and she developed an infection in her lungs. Everyday after this we saw our baby girl slip away from us. November 10 was the worst day of our lives as Adelyn was in so much pain and she was fighting so hard to stay alive. We would just hold her little hand and she would squeeze our finger so tight. It was very clear to us that we needed a miracle. We prayed that God give us a miracle but if he wanted her in heaven that he take her soon so she would not have to suffer any more. On November 11 at 5:50 p.m. Adelyn earned her wings and our Lord called her to heaven. Our family was holding Adelyn as she passed away and this moment will be in our hearts forever. Our baby girl was with us for a very short time but she changed our lives forever. She taught us how to fight, how to love, and how to live. She saved us and is our guardian angel. We look forward to the day we can see her again but until then we will do everything we can to make her proud. We love you baby girl! To read Adelyn's daily journals click here. ​To view a special 10/11 News story on Love Adelyn click here.